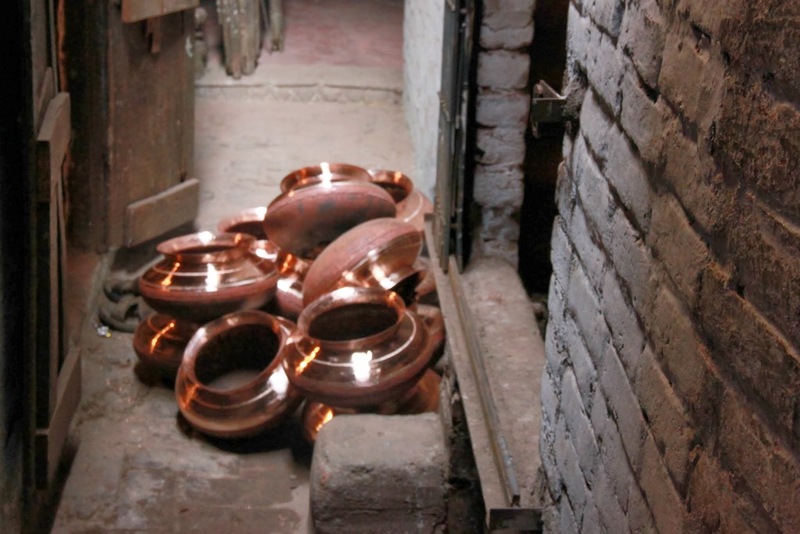 Copper finds a pride of place in kitchens across India as it is held in high regard by Ayurveda for its remedial properties. The metal is believed to have electromagnetic energy, called ‘Prana Shakti’ and many Indian homes store drinking water in a copper vessel overnight to allow copper to make water ionic, thus helping to maintain the body’s alkaline balance. Vessels made from this medicinal metal can be found in countless streets in India. But for uniquely engraved utensils made from copper one must walk along the shops lining Yahiaganj bazaar in Lucknow, the city that has perfected the art of gracious hospitality or Mehman-Nawazi. In these narrow streets artists have been carrying forth the age-old tradition of ‘Naqqashi’, the art of decorating metals with intricate designs. The technique is a painstaking process involving constant hammering with a flint and hammer to carve out a particular design. Often the utensils are covered in ‘kalayi’, a fine silver coating that involves spinning it over burning coals, with intermittent rubbing in powder before its new skin shines through. Lucknawi ethnicity and Nawabi traditions find perfect expression in the decorated ‘Paandaan’, ‘Khaasdaan’ and ‘Ughaldaan’, all accompaniments for storing and consuming betel leaf preparations. Daily use water containers and pots also come under the hammer before being displayed for the local kitchen or a discerning traveler. Stories from the past unfold as generations of families practicing this art continue to promote the artistic, cultural and social activities of their time brought alive through each decorative piece that leaves the maker to begin a new journey. Posted in Ayurveda, Crafts, History, Tips, Uttar Pradesh and tagged Ayurveda, Copper, copper vessel, electromagnetic energy, Engraving, India, Kitchen, Lucknow, Naqqashi, Nawabs. Bookmark the permalink. Why do Indians wear Tilak on their Foreheads?